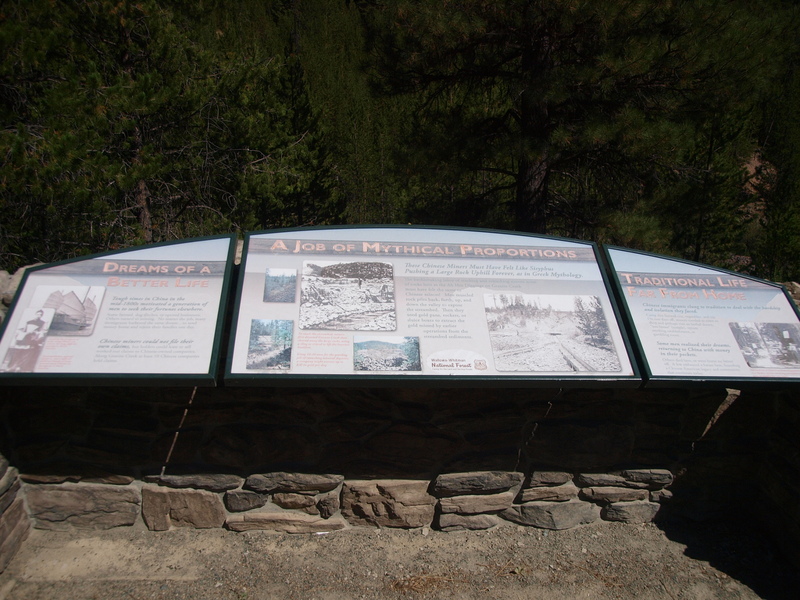 Just north of the Ghost Town of Granite Oregon on National Forest Road 73 is a small wayside with this interpretive sign. 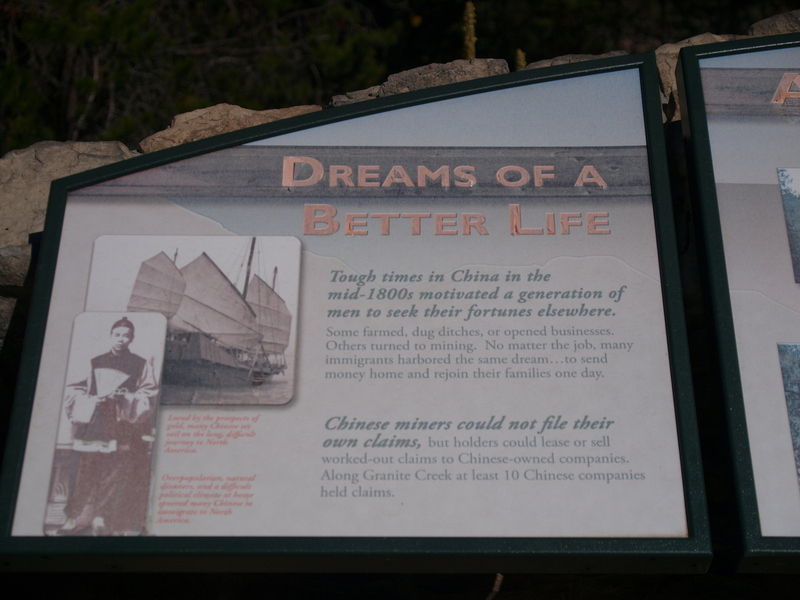 Though times in China in the mid-1800s motivated a generation of men to seek their fortunes elsewhere. Some farmed, dug ditches, or opened businesses. Others turned to mining. No matter the job, many immigrants harbored the same dream… to send money home and rejoin their families one day. These Chinese Miners Must Have Felt Like Sisyphus Pushing a Large Rock Uphill Forever, as in Greek Mythology. 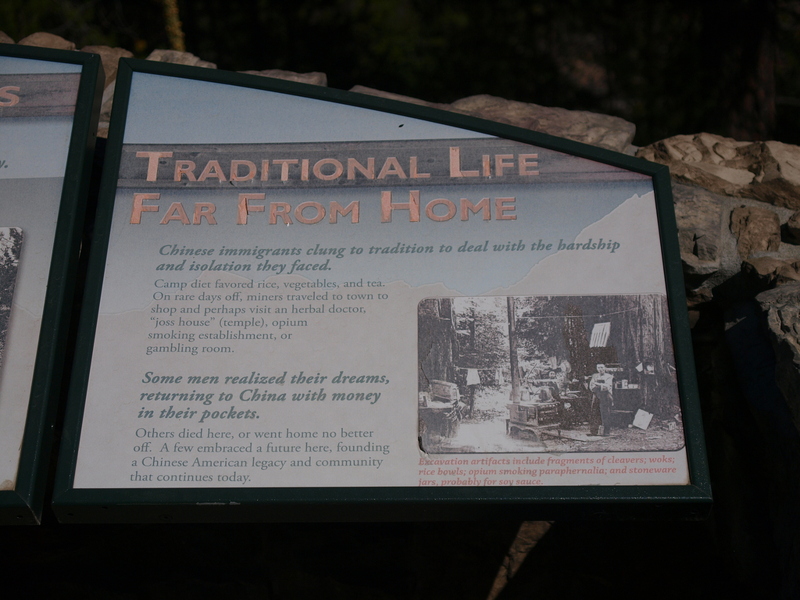 Chinese immigrants clung to tradition to deal with the hardship and isolation they faced. Camp diet favored rice, vegetables, and tea. On rare days off, miners traveled to town to shop and perhaps visit and herbal doctor, “joss house” (temple), opium smoking establishment, or gambling room. Some men realized their dreams, returning to China with money in their pockets. Down below, hidden in the trees, is the view of these “Chinese Walls.” Priscilla Wegars, of the University of Idaho, led an archeological and anthropological team here in the early 1990s to explore this area. Their findings positively identified it as a Chinese Mining site. In addition to the over 4000 artifacts found, they identified a unique terraced cooking area, habitation areas, and a 3 mile long ditch. 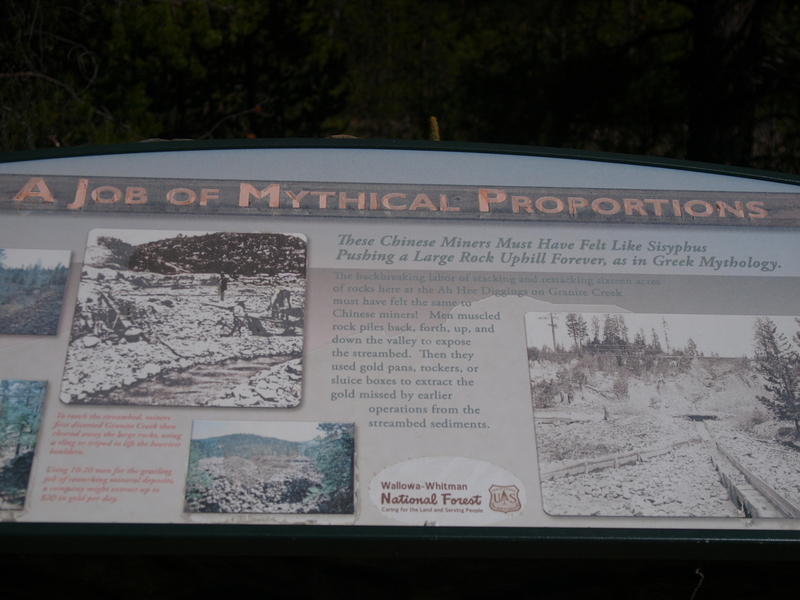 Not to mention the “Chinese Walls” made of rocks six inches in size all the way to “boulder.” In some places these walls are fifteen feet high and twelve feet thick, all made of rock moved by hand. 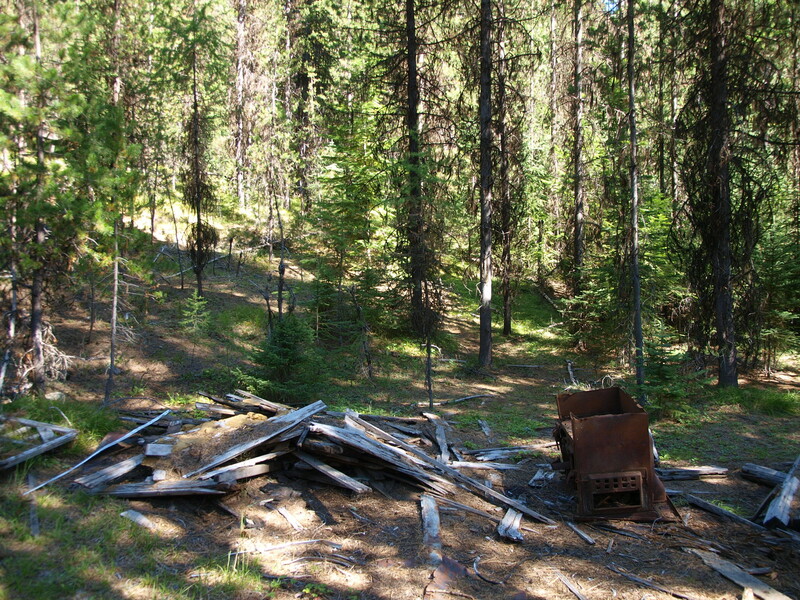 Less then a mile up the road, barely seen in the brush but easily accessible, is a small cabin. 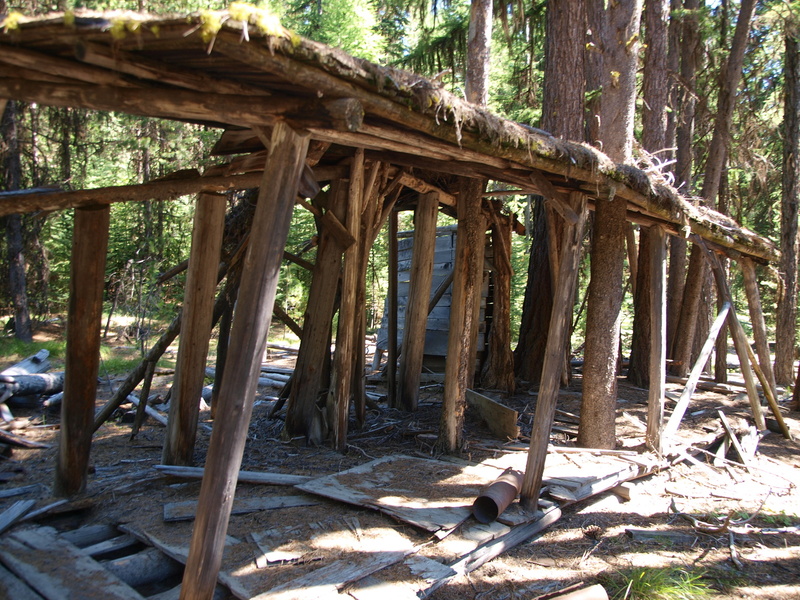 In a previous post I had identified it as a general store, very likely used by the Chinese laborers here. Next to the cabin is this interesting sheltered area. I’m puzzled as to it’s use, the “floor” is lined with full round logs that have a gap between each one and there is a definite large hollow space underneath. It’s sort of long and thin, so I though at first it was a saw mill, but I wonder if it was some sort of stall for animals. 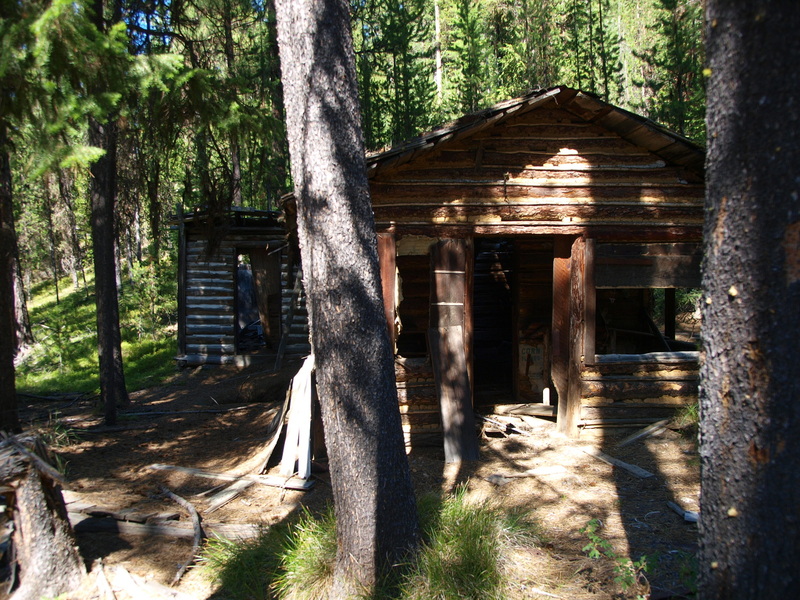 The area around the cabin is quite flat and devoid of trees even now. Very likely a tent city existed here and played home to a bustling community. Now days it’s only populated by rusting and frequently unidentifiable junk, discarded trash from recent decades, and a thick covering of rotting pine needles. 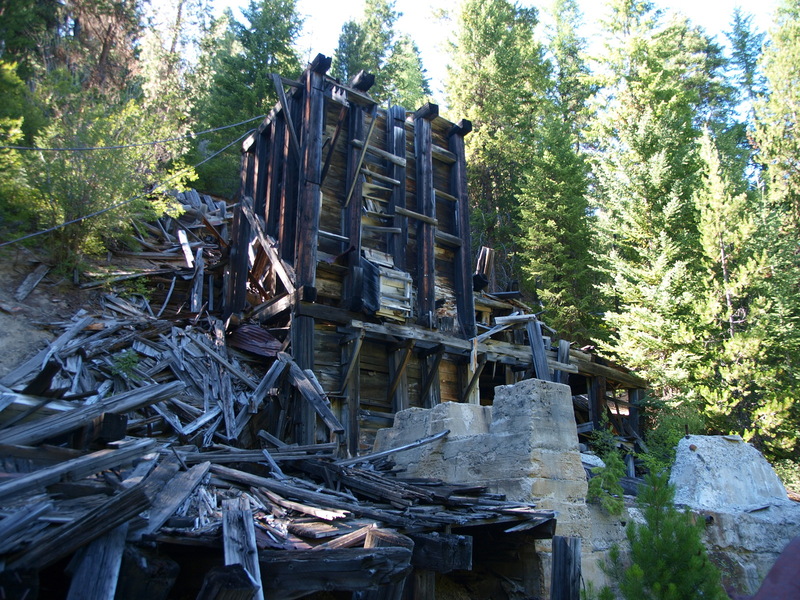 And another mile up the road is this abandoned mine. I don’t have any records of it’s name or who owned it, but it was very likely at least worked by the Chinese too. Now days it’s an unsafe pile of rubble that one should not enter at all. If you have any knowledge or memories about this area, please leave a comment below!